On the morning of Saturday December 4, Venus will be at its brightest for the current morning apparition. This week Venus will be at itsbrightest for many monthsto come and hit its peak as a brilliant jewel in the sky on Saturdaymorning. Due to a combination of its orbitalpath and amount ofreflected sunlight, on Saturday (Dec. 4), Venus will shine so brightlyitshould be unmistakable to skywatchers with a clear morning sky. 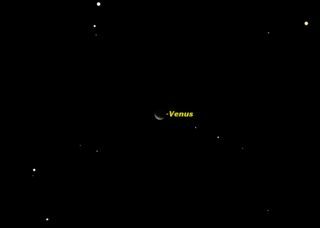 This sky mapshows where to look to see Venus onSaturday morning. As the Earth and Venus circlearound the sun in theirrespective orbits, their changing geometry causes Venus? brightness tovary. Asyou might expect, it generally tends to be brighter when it is closerto Earth.However, this isn?t always true because Venus is an "inferior"planet. Astronomers use "inferior" to mean"closerto the sun" rather than "lower in quality." So, the planetsMercury and Venus are both known as "inferior planets." As a result of its orbit beingcloser to the sun than theEarth's, Venus passes between the Earth and the sun once every 584days. Thisis known as "inferiorconjunction," and last occurred on Oct. 29. Even though Venus was closest toEarth on that date, itwas ? for all intents and purposes ? invisible. That's because on Oct.29 Venuswas almost entirely backlit, except for a tiny amount of sunlightleakingthrough its upper atmosphere. But over the last five weeks, Venushas moved along itsorbit such that, while it is farther from the Earth than it was in lateOctober,it is now more brightly illuminated by the sun from the side. Thismakes moreof Venus'cloud tops visible and gives the planet a brilliant shine. On Dec. 4, these two factorsbalance out to result in Venusbeing the brightest it can be. Astronomers measure brightness using atermcalled magnitude. The lower the number of an object's magnitude, thebrighterit is in the sky. This Saturday, Venus will have amagnitude of minus 4.9,while the sun is minus 26.8, the moon is minus 12.7, and the brighteststarSirius is minus 1.4. When Venus is this bright, it iseasily seen in a clearblue sky with the naked eye, if you know precisely where to look. Thebest wayto find it is on the day when it is closest to the moon, since it?smuch easierto find the bigger brighter moon in a blue sky. A good example was yesterday morning? Thursday, Dec. 2 ? around9:30 a.m. ET, when both the Moon and Venus will be due south (forobservers inthe northern hemisphere) and Venus will be 7 degrees (1 binocularfield) abovethe moon. You can find Venus first with binoculars, andthen try to spot itwith your naked eye. If you miss it this time, you can try again onDec. 31. In binoculars or a small telescope,Venus now appears as anarrow crescent, similar to the moon. In fact, if you checkedthepre-dawn sky on Thursday morning, you may have seen the 26-day-oldmoonright next to Venus, while both showed almost the same phaseillumination,since both were being lit by the sun from about the same angle. This article was providedto SPACE.com by StarryNight Education theleader in space science curriculum solutions.